Last month, Kotaku reported that student interns were allegedly forced to manufacture the PlayStation 4. With the PS4 now out, rumors have popped up that some of those alleged student interns sabotaged Sony's gaming console. Those rumors are spreading online, but, juicy as they are, they're very thin. Here's what Kotaku has sorted through and attempted to untangle as we try to figure out what's really going on. It's common knowledge that unlike the launch PS3, which was made in Japan, the PlayStation 4 was outsourced to Foxconn and allegedly manufactured at its plant in the Chinese city of Yantai. As pointed out last Friday on IGN's boards, a thread appeared online in China on August 28 in a forum set up for Xi'an Technological University North Institute, the Chinese university with the alleged forced Foxconn internships. In the thread (translated by IGN's forum member Qbroid), one student claimed, "Since Foxconn are not treating us well, we will not treat the PS4 console well. The PS4 console we assemble can be turned on at best." The thread has since been deleted. It might have been censored. It might have simply been taken down because it's not true. Who knows. Above, you can see a screenshot of the alleged comment. It was last Friday that IGN boards pointed this late August Chinese forum comment. If the system is broken, don't blame us students. When we were studying, they shipped in 20,000 migrant workers from Guizhou. On top of that, there were also many Yantai local students and long-time Foxconn workers at the factories. The people that made the news were us Xi'an Technological University North Institute students. 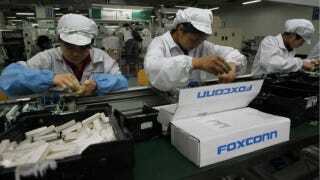 We're not even 1/10 of the workers at Foxconn. So don't blame the issue on us Chinese students, and don't talk about Foxconn on this board. You have no idea how hard it was to work in the factories as a recent high school graduate. Feel free to ask questions about the PS4 but not about Foxconn. Those with dirty mouths aren't welcome. This same forum user blamed the Taiwanese for the tough working conditions at Foxconn, which is a Taiwanese, and not Chinese, company. But was this comment in response to the late August Chinese forum post recently unearthed on IGN's boards? Then, there were also other alleged online comments in which workers (it's unclear if they were students or not) apparently talked about spitting in consoles and taking parts out of the factory. They were posted on a Chinese forum in September and seem rather iffy. Essentially, they seem to just be a chatlog. It's also important to note that Nintendo and Microsoft also outsourced their consoles to Foxconn. Sony, however, is dealing with PS4 hardware issues. The odd part is that the news stories in China regarding the internship sabotage allegations all seem to stem from the IGN forum, meaning that ultimately, all of this is based off of alleged sources—something that certainly should be taken into account. Ditto for the fact that the IGN forum member who uploaded these images has been an IGN forum member since last Friday. Since this weekend, Chinese sites like GamerSky and TechWeb, both of which are fairly large sites (their Alexa rank is under 500, fyi), have stories up detailing the PS4 woes and mentioning these Chinese forum posts unearthed on the IGN boards—though, don't assume they're holding them up as cold, hard fact. NetEase, one of China's largest internet sites, discussed the student employees and quality control issues. The IGN member, Qbroid, who started this on Friday. also made a post after the thread he or she created on IGN was locked down. In it, Qbroid explained that he or she was simply bringing over content that had been online in China for months before bringing it over to IGN's forums, adding that while he or she indeed could not guarantee whether the original thread's content was genuine, ignoring it is like "burying one's head in the sand." Rumors. Disgruntled workers. And all sorts of accusations. With all this scuttlebutt, it's a shame that Sony didn't produce the PlayStation 4 at one of its own plants with Sony employees. I can't help but feel that there would be less of these lurid allegations. Kotaku is following up with Sony and will update this story should the company comment.